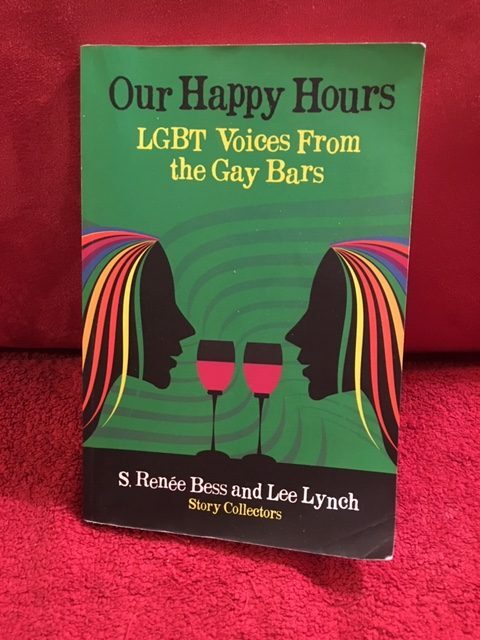 Our Happy Hours: LGBT Voices from the Gay Bars was born out the of tragedy of the Pulse Night Club Massacre in Orlando, Florida. The story collectors, S. Renée Bess and Lee Lynch, were moved, enraged, frightened, emboldened with all the possible opposing emotions such an event can arouse. Memories of what the gay bar has meant throughout LGBT history and the part it played in bringing us together as a culture were reawakened and they knew that our bar stories had to be told. So, they sent out the call. This book is the result. When I first sat down with the intention of reviewing this book, I made a plan of how to go about it. It’s an anthology so I couldn’t speak of character development or author voice or even theme and there were too many pieces to discuss them all in one review. I decided the best way to approach this task was to read each piece and put a check mark on the first page of the ones I found truly wonderful. These would be the ones I would single out to talk about. As I approached the end of my task I looked back over my work and realized I had checked every piece. My method was definitely not working. The short stories, memoirs and poems in this volume are all exceptional. Not a clinker in the bunch. The editors or the cooler term ‘story collectors’ as they prefer to be called did a fantastic job and there is something in this book for everyone. Some writers remember the bars in the sixties; others remember them in the late 1990s or even the early 2000s. There are lesbians, gay men, Drag Queens, Drag Kings, Transgendered folks; there are brown people, white people (although no one can truly be said to be white.) and immigrants. There’s even one piece that delves into magical realism. This collection is filled with joy, sadness, nostalgia and longing. Some pieces are funny; others are sad. And some are both. Many wonder authors what we’ve gained and lost with the new freedoms of today. And more than one reflects and mourns about the violence at Pulse. I was reading Happy Hourswhile I was rolling a ball back and forth with my left foot. Physical therapy. The young African American intern who was helping me, noticed the colorful cover and asked about the book. I explained that is was an anthology of LGBT stories and gave some examples. He took a picture of the cover, so he could purchase the book later. He told me he commuted by train to his job in the city and he thought having a book of short pieces was a great idea. Now, he could actually finish a piece or two without having to stop in the middle when he arrived at his destination.